If you want a canopy bed for your room, first you have to understand the effect that it will be having on your room as well as its other functions other than to make the bedroom look stylish. People who want to have an elegant and theatrical like bed would easily go for this type of bed without taking other considerations in terms of the effect of this bed on the room. The size of the room should really be taken into consideration. 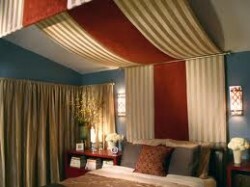 The canopy beds can have different effects in terms of the size of the room. The amount of space occupied by the bed as well as the added space occupied by the curtains can make the room look smaller especially if there are too much details going on in these curtains. If the room is too small then a large canopy bed may suffocate the space, eating up the area, making it difficult to move around in. On the other hand, there is also a positive effect of the curtains being hung on the ceiling or the top posts of the bed and allowing the curtains to fall. The curtains create an illusion of height on the bedroom especially if these curtains are hung on the ceiling above the bed. The length on the room from the ceiling to the floor is highlighted by the curtains, even making it look as if it has increased in height. The canopy beds also have their own personalities. They also bring a certain theme to the room, depending on the people using it. You may want to choose a canopy bed depending on the kind of feel you would like to achieve using the canopy bed. If you’re a single woman or you’re choosing the canopy bed for a teenage girl, try and ask her if she likes the princess-like theme for the bed. The canopy bed easily makes the bed and the room itself, look like a royal chamber. The canopy bed is definitely for women of all ages who want to have their beauty sleeps on a bed where they can feel like a princess. If you’re sharing the bedroom with your partner, then the canopy beds will definitely get you the romantic bedroom that the both of you want. Give your bedroom a more intimate and inviting feel with the dramatic curtains that enclose the both of you when you’re in bed together. On the other hand, if what you are simply going for is a stylish bed for your bedroom that will kick boring and ordinary out of your room then you can always go for the single canopy bed. This canopy bed will not occupy too much space and will give enough personality and elegance to your own room. Canopy beds take the experience of sleeping and stylish bedroom to a new heights. However the success of the canopy bed as an effective bed for your room will depend on the type of bed you chose and how you use it in your room.